PMEP Distance Learning Center: Partnership with the Pesticide Management Education Program and New York State Integrated Pest Management. Successful completion of this module will earn you 1 recertification credit for New York State DEC certified pesticide applicators in categories 1a, 10, 21, and 23. Several other states in the Northeast have approved pesticide credits for this course. The Capital Area Ag Report for June 26, 2014 is now available online. Click here for the issue in PDF format. Most, but not all, spring barley and wheat fields in New York State are now past the flowering and early post-flowering stages. This week remains critical for farmers making fungicide spray decisions for suppression of Fusarium head blight (FHB) and protection of flag leaves from foliar diseases in late flowering spring cereals. The triazole products Caramba and Prosaro are the most effective fungicides for suppression of FHB and deoxynivalenol (DON) toxin contamination when applied at wheat flowering (emergence of anthers on heads) or at full head emergence in barley (anthers begin to appear on barley before heads emerge from the boot). A flowering application of triazole fungicide should be based on Fusarium head blight (FHB) risk as well as the risks of powdery mildew, rust, and fungal leaf blotches in the upper canopy based on scouting of individual fields. There is an application window of approximately 5-6 days from the beginning of flowering in which reasonable FHB suppression can be expected. Fungicide products containing strobilurins should not be applied to headed wheat or barley as they may result in increased levels of DON in grain. The current risk of FHB epidemics is low to moderate for spring wheat and barley over much of the state but precipitation patterns have been highly variable across the state. Check the Fusarium Risk Assessment Tool (http://www.wheatscab.psu.edu/) and your local weather forecast frequently as your crop approaches flowering. This is an excellent time to scout your winter cereal fields to assess FHB incidence and to identify fields that may be at higher risk for DON toxin contamination. Get the full issue or subscribe by email to receive notifications of new reports including Videos from the Field throughout the summer. Northern New York – Research conducted on Northern New York farms by Cornell University researchers with funding from the farmer-driven Northern New York Agricultural Development Program (NNYADP) is helping farmers enhance their production of forage crops for their dairy cows. Eight farms in Northern New York participated in on-farm double cropping trials from 2011 to 2013. The research specifically refines nitrogen fertilizer management guidelines for fields that will be used for double cropping – the practice of planting two different crops on the same field in which the second crop is planted after the first has been harvested. By using the same land to plant two crops that can be fed to dairy cows, farmers can offset previous-year dairy cow forage inventory losses due to drought, excess water, or other causes. Growing winter cereal crops, such as cereal rye, triticale or wheat in a double-cropping system can also help with on-farm manure use, reduction of nutrient loss to the environment, and increased production per acre. The complete report of the NNYADP double-cropping nitrogen management trials titled Winter Forage Small Grains to Boost Feed Supply: Not a Cover Crop Anymore is now posted at www.nnyagdev.org. Profiles on growing 70 acres of triticale as a double crop with corn at Brandy View Farm in Madrid, NY, and a cereal rye trial at BCS Dairy in Peru, NY, are also posted on the NNYADP website. The Northern New York Agricultural Development Program is a small grants research and technical assistance program helping farmers in Clinton, Essex, Franklin, Jefferson, Lewis and St. Lawrence counties. The NNYADP receives funding through the New York State Legislature. ‘Our research platform addresses a primary question identified by Northern New York (NNY) farmers, that is, how to manage nitrogen application for double-cropping, particularly at dormancy break in the spring,’ says project leader and Cornell Nutrition Management Spear Program Director Dr. Quirine M. Ketterings. The objective of the ongoing NNYADP-funded research is to calibrate the most precise optimal nitrogen application rate to achieve high-yield, high-quality crops in a double-cropping system. More precise N application may reduce production costs as well as the environmental loss of nitrogen not taken up by the crops. Project results to-date include data from seven trials conducted on farms in Northern NY and more than two dozen other farms statewide. In 2013, forage yield of double crops averaged 2 tons/acre statewide and 1.8 tons/acre in NNY. Soil fertility and the need for nitrogen varied widely by site in the NNY trials, e.g, three sites of the seven NNY sites showed no yield response to additional applied N while three others needed 75 to 90 lbs. N/acre to reach optimum yield. This research continues in NNY and statewide in 2014 to determine how planting date, manure application history, soil type and other factors might impact the differences in yield, in crude protein content of the crops, and optimum N rates across the different sites. An additional NNYADP-funded field trial compared cereal rye, oats and radishes planted as cover crops at Thunder Lane Dairy in Lewis County. The results of the trials at Thunder Lane Dairy indicated that radishes had the greatest root, shoot, and total biomass accumulation of the three species, but nitrogen accumulation was limited to 28 lbs. N/acre by radishes vs. 17 lbs/acre for cereal rye, and 11 lbs. N/acre for oats. However, because radishes and oats typically winterkill in Northern New York and will not accumulate more N into the spring season, cereal rye becomes the more feasible choice. Cereal rye typically overwinters and accumulates additional biomass in the spring, typically averaging 1.5 times the total N accumulated in the fall, based on field assessment over the past several years. Northern New York producers and NNYADP committee members are now interested in answering the questions: What are the costs and benefits associated with incorporating double crops into cropping systems, and what yield levels are needed to ensure that the adoption of double crops will be a profitable change for farms in the northern region of New York State. In addition to the regional farmers, NNY double-cropping project collaborators include the Cornell PRO-Dairy Program, Cornell Cooperative Extension, the Lowville Farmers Co-op, and independent crop consultants. Last week temperatures ranged from 0 to 2 degrees below normal for most of the state. Precipitation amounts ranged from less than a quarter inch to over an inch (not including Wednesday’s heavy rain). Base 50 growing degree-days ranged from 60 to 140. Cloudy day today as the rain moves out and leaves us with a nice and sunny weekend. Warm and humid weather with scattered showers and thunderstorms into the workweek. Today the rain will slowly move east and out of the state but skies will remain mostly cloudy. Highs will be in the mid 70’s to low 80’s. Overnight temperatures will range from mid 50’s to low 60’s. Friday will clear up with mostly sunny skies and temperatures in the low to mid 80’s. A few scattered showers can’t be ruled out, but any that do occur will be very light. Overnight temperatures will range from mid 50’s to low 60’s. Saturday will be sunny with highs in the low to mid 80’s. Overnight lows will be in the 60’s. Sunday will be partly sunny with highs throughout the 80’s and slight chances for showers and thunderstorms, more likely in western NY. Lows will be in the mid to upper 60’s. Monday will be partly cloudy with a chance of scattered showers and thunderstorms and highs throughout the 80’s. Overnight temperatures will be in the mid 60’s to low 70’s. Tuesday will be partly cloudy with a chance of scattered showers and thunderstorms and highs throughout the 80’s. Overnight temperatures will be in the mid 60’s to low 70’s. Wednesday’s highs will be in the low to mid 80’s, again with scattered showers and thunderstorms possible. Overnight temperatures will be in the mid 60’s to low 70’s. The five-day precipitation amounts will range from 1/10” to ½” ; 7-day amounts will range from ½” to 1 ½”. The 8-14 day outlook (July 3 – 9) is showing above normal temperatures and above normal precipitation. If you have ground that you worked up to plant corn but didn’t yet…. You may want to consider brown mid rib sorghum sudangrass because it can produce better in hot dry conditions that are usually associated with this time of year. Agricultural plastics recycling is taking off, big time! Recyclers working with Cornell University’s Recycling Agricultural Plastics Program (RAPP) are now able to process virtually all types of used farm plastics. Much of this old plastic is turned into new products by manufacturers right here in New York State. Waste plastics previously used on NYS farms—primarily bale wrap, bunker covers, mulch and greenhouse film—are being transformed into sheets of plastic ‘plywood’, plastic sidewalk pavers, household and industrial-size garbage bags, and diesel fuel, as well as into new plastic containers, films and twine that will once again be used on farms. RAPP will showcase an array of these products, as well as supplies and equipment for storing and compacting used plastic, at Empire Farm Days, August 5-7, 2014. Find RAPP at Booth #500, just outside the main entrance to the Cornell Building. Empire Farm Days—the largest outdoor agricultural trade show in the Northeast—will once again be held at the Rodman Lott & Son Farms on NY-414, just south of the village of Seneca Falls, NY. Baler Operator Training Course: 10-11am each day of Empire Farm Days. At 10am each day of the show RAPP will offer a free one-hour Training Course in operating the BigFoot BF300 plastic baler. This will be an hour well spent because trainees will be a giant step closer to receiving the required certification to operate a BigFoot independently on their own farms. Participants will be given a free instructional DVD to reinforce what was taught. Pre-registration by July 22 is requested, but drop-ins will be welcome if space permits. To sign up, call RAPP at 607-255-1187 or email agplasticsrecycling@cornell.edu. For those who simply want to see the BigFoot work its magic, stop by at 2pm any day of the show for a demonstration. It’s quite something to watch this baler transform a mountain of plastic into a dense, 1000-lb, four-foot cube in just about half an hour. The trick to keeping plastic in shape for recycling is to keep it free of grit and gravel, and as clean and dry as is possible under farm conditions. Demonstrations of these ‘best management practices’ (BMPs) will be ongoing throughout Empire Farm Days, with specific tips on how to handle each type of farm plastic. BMPs and other recycling resources can also be found online at RAPP’s website: recycleagplastics.cornell.edu or Facebook page: facebook.com/Recycling.Agricultural.Plastics. 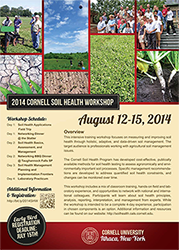 The 2014 Cornell Soil Health Train-the-Trainer intensive training workshop focuses on measuring and improving soil health through holistic, adaptive, and data-driven soil management. The target audience is professionals working with agricultural soil management issues. The Cornell Soil Health Program has developed cost-effective, publically available methods for soil health testing to assess agronomically and environmentally important soil processes such as aeration, infiltration, water storage, drainage, root growth, disease pressure, biological activity, nutrient storage and release, etc. Specific management recommendations are developed to address quantified soil health constraints, and changes can be monitored over time. This workshop includes a mix of classroom training, hands-on field and laboratory experience, and opportunities to network with national and international colleagues. Participants will learn about soil health principles, analysis, reporting, interpretation, and management from experts. The workshop includes a field trip to local farms to discuss adopted soil health practices, field assessment of soil health status, and appropriate management options, as well as a lab practicum. While the workshop is intended to be a complete 4-day experience, we are enabling participation in chosen components this year to meet stakeholder needs. Additional information and resources about the Cornell Soil Health Program can be found on our website: http://soilhealth.cals.cornell.edu.